Duviella, E.; Bako, L.; Sayed-Mouchaweh, M.; Blesa, J.; Bolea, Y.; Puig, V.; Chuquet, K.
Inland navigation networks offer an alternative to land transport with economic and environmental benefits, and direct access to urban and industrial centers. Promoting the navigation transport requires the modernization of the network management, in particular the control of navigation levels and the improvement of the network safety. To reach these aims, modeling methods of the inland navigation networks have to be proposed. These networks are large scale distributed systems characterized by non-Iinearities, time-delays and generally no significant slope. A modeling method of a navigation channel based on identification method is proposed in this paper. 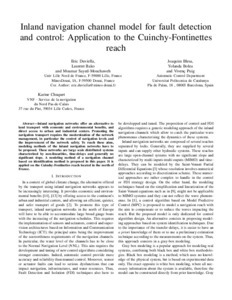 It is applied on the Cuinchy-Fontinettes reach located in the north of France. Duviella, E. [et al.]. Inland navigation channel model: application to the Cuinchy-Fontinettes reach. A: IEEE International Conference Networking, Sensing and Control. "Proceedings of 10th IEEE International Conference on Networking, Sensing and Control (ICNSC), 2013". Evry: Institute of Electrical and Electronics Engineers (IEEE), 2013, p. 164-169.